Back in 2012 we released the first EP on Mister Saturday Night Records. It was a collection of three songs from a young guy named Anthony Naples, a regular on the Mister dancefloor. He’d never released a record; and in fact, he’d never even finished a track before he gave us the final tunes; but they were excellent, and when we released them, people got really excited. Flash forward a few years, and Anthony’s become an important music maker for a lot of people. He released a second EP for us, a couple EPs on Trilogy Tapes, a cohesive and mature LP on Four Tet’s Text label; and he built up his chops as a DJ. In fact, he moved out of the city for a couple years to play gigs all over the world. But now he’s back in New York (for good, we hope), and to celebrate, we’ve decided to do something we’ve never done before: hand the reins of an entire Mister Saturday Night party over to someone else. 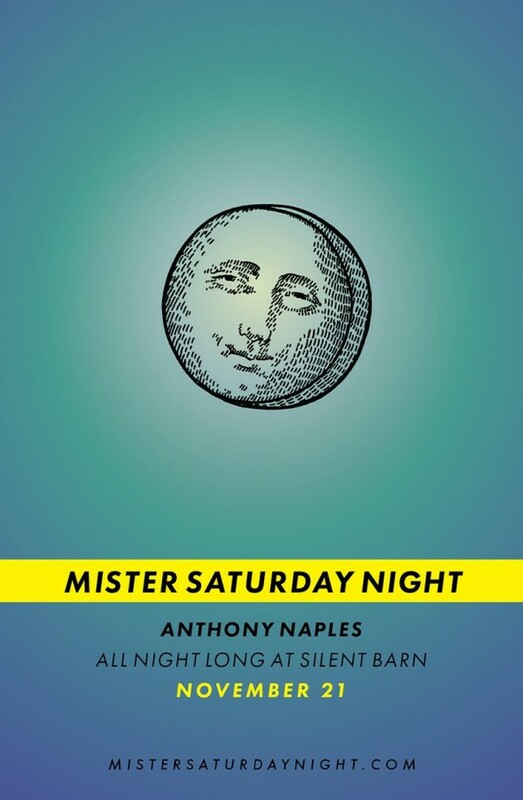 On Saturday, November 21st, Anthony Naples will control the Mister Saturday Night soundsystem from 10pm to 4am at Silent Barn, one of our favorite places for a party in New York City. Not only does our system sound great in the room; there’s a barber shop in the back, a vintage clothing stand, crates of records to dig through, a nice outdoor patio, and a bar with inexpensive drinks.